Tonight marks Midwinter Solstice, the shortest day of the year in the southern hemisphere. In a more temperate Auckland midwinter passes by without too much fuss; but down south, midwinter is celebrated in style. Down south, there is something invigorating about a true winter’s day… and the weather is always the first topic of conversation. 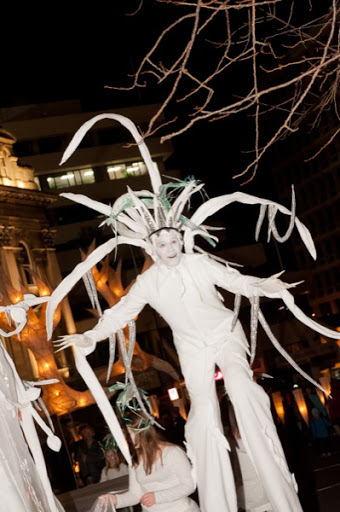 The Midwinter Carnival held on the Saturday nearest to the shortest day has a procession with hundreds of lanterns, many made by children, stilt walkers and performers in the city’s centre…if the weather permits! It will be no surprise that my tour of Dunedin city is focused on food. My choices have been influenced by my interest in the Victorian and Edwardian architecture of the city. centre; First Church and right; Robbie Burns with St Pauls Cathedral in the Octagon. 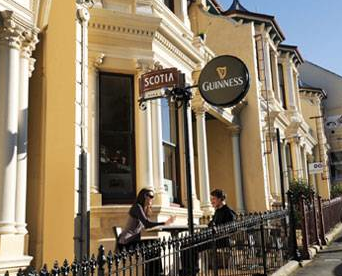 In a city that looks, sounds (busking bagpipers) and feels like Scotland (a wee bit chilly) it’s most fitting that there is a restaurant called Scotia Bar and Bistro. I like the ambience and cosy feel as well as the good food. Enter this Victorian terrace house and you come to a bar with a wall of whisky and a warming fire. You can choose to have a pre-dinner drink beside the warm fire. The food by chef Andy Aitken has a touch of Scotland in the menu choice. You can choose Haggis as an entree, which is surprisingly tasty and I had the best cooked Bluff oysters there. 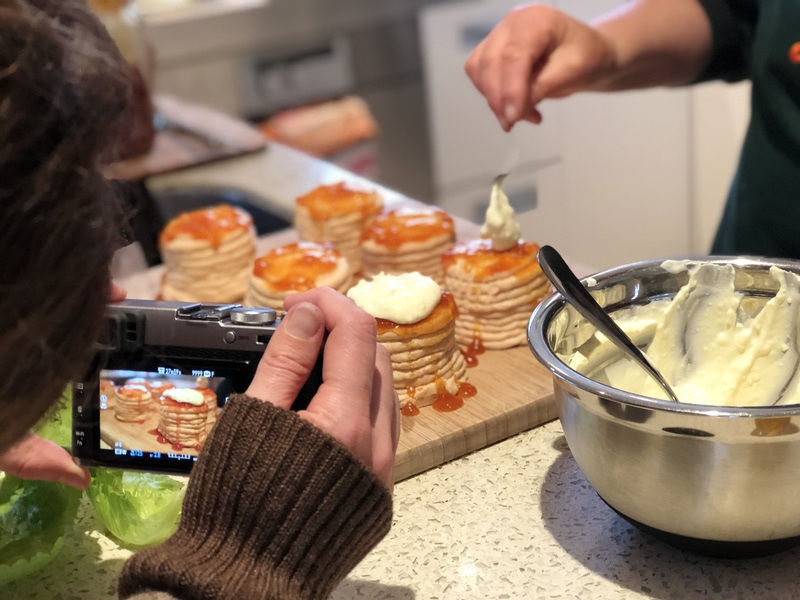 Smaller, cheaper meals are on offer, which are ideal before going just up the road to the The Fortune – Otago and Southlands Professional Theatre. First it’s got a large range of organically grown fruit and vegies, organic meats and a large selection of flours, grains, oils, dried goods, garden seeds, herbal products and spices. I must say it’s one of the best organic supply shops around. I suggest going down to the back of the shop where large glass jars contain different dried fruits and find the crystallised ginger short sticks from the US, fill a small bag and enjoy the sugar coated punch of ginger. I haven’t found that ginger anywhere else. Ginger is great eaten with dark chocolate and almonds…yum. Second, the kitchen that used to only do takeaway lunches now has seating so you can choose to have your lunch on site. I love the casual atmosphere here, where you help yourself to a warming soup from a slow cooker for around $6 and another $1 for a thick slice of fresh baked bread, and pay later at the shop counter. The soup is made from ingredients from the shop and Mark the owner’s garden at Waitati. It’s great soup, the best value in town with probably the best food values as well – and believe me soups are very desirable midwinter in Dunedin. Thirdly, the building has a wonderful history dating back to the 1800’s when Dunedin was a boom town. You can still see along the top of the building Bing Harris. They were importers of the materials that supplied the many clothing manufacturers in the city. The new property developers have used old features really well, preserving the integrity of the old city for modern use. Around the corner on Princes Street another lovely old building houses Nectar Espresso Cafe where you can get an excellent coffee. 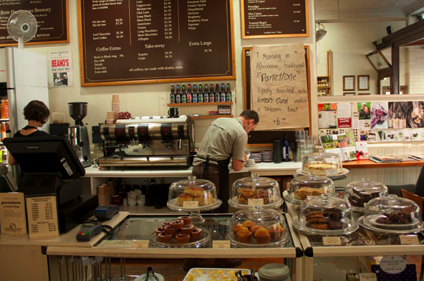 It’s fitted out in a modern style, with the good bones of the old building very much in evidence (and their pinwheel scones are yum but you have to be there before 11 because they usually sell out fast). You always remember a city by the characters you meet. Both Athol Parks of City Walks and Andrew Smith of Hair Raiser Ghost Tours certainly fit that bill. Athol has a quiet manner and conveys insights into Dunedin’s Victorian and Edwardian architecture with passion and knowledge. Athol is usually dressed for the Dunedin climate in a weather proof jacket while the flamboyant Andrew wears a top hat and cape for his ghost stories and yarns about the mysterious characters of early Dunedin. the Octagon during the Rugby World Cup 2011. Andrew’s Hair Raising tours operate every day and the ghost tour every night over winter at 6pm -a good way to work up an appetite before dinner. 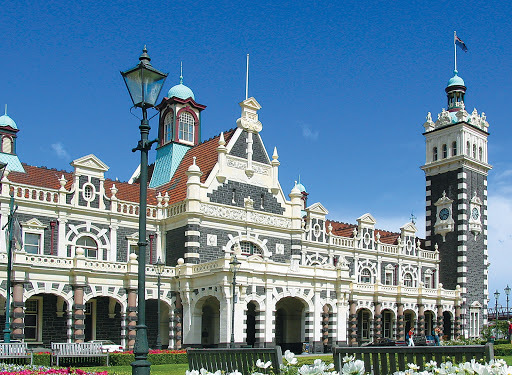 Athol’s tours run only by request over the winter but keep him in mind if you are in Dunedin from October on. Everything I have ever eaten at Everyday Gourmet has been delicious. The Supreme coffee is excellent and the service friendly. Having been in business for 18 years it is a Dunedin institution. Longevity in a cafe speaks of consistency and quality. For under $10 you can get a tasty and seasonal salad and coffee. It is also a fabulous ‘deli’. I have met many small producers at Farmer’s markets and when asked if they have an outlet in Dunedin often the reply would be, “Yes, Everyday Gourmet sells our product”. 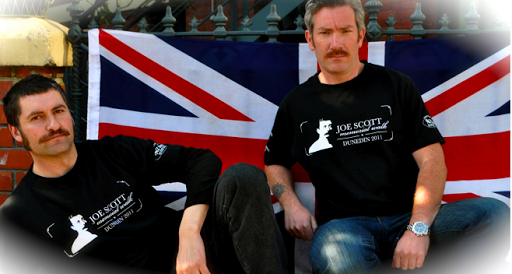 from New Zealand and overseas. Everyday Gourmet can be found at the north end of George Street near Knox Church…its worth the walk. Quadrant Gallery features contemporary jewellery, some made by owner David McLeod as well as stunning glass sculptures and ceramics. 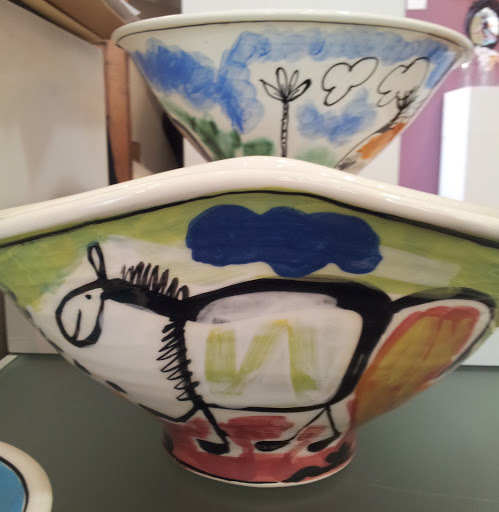 I love the whimsical work of potter Peter Henderson. I particularly like his coffee cups with animals. The glaze is top quality and can take a beating in the dishwasher for years. I worked in Quadrant for a short time and thought I had landed in paradise amongst so many lovely pieces of jewellery. 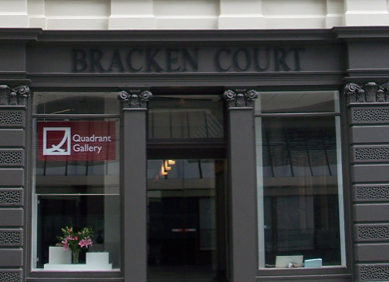 The building where Quadrant is situated, Bracken Court, is owned by Ted Daniels. Ted an accomplished jeweller himself and loves buildings with character. When a recent fire destroyed this building, instead of pulling it down and replacing it with a modern one, he kept the stone facade and made a sympathetically designed modern building behind. Next door to Quadrant is Cilantro Cafe where you can enjoy a coffee and admire lovely objects through the internal glass walls. Quadrant is just one of many galleries and interesting shops in this ‘quarter’ of the old city. 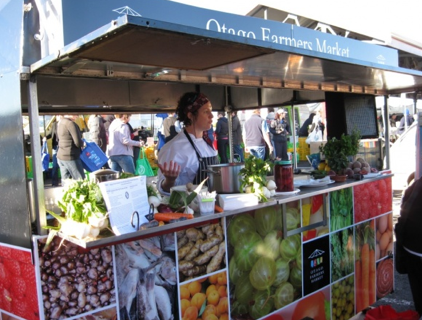 The farmers market has been operating for 12 years and is a regular Saturday morning routine for Dunedin foodies. It’s not only fresh produce on sale, its an opportunity to talk to producers directly, try new things and catch up with friends. The highlight of my visit is catching up with Alison Lambert in the mobile kitchen. Alison demonstrates easy ways of cooking with produce on sale at the market. She is inspirational in the way she can produce something delicious out of a caravan with just a gas hob and small oven, sometimes in a southerly gale. This means every recipe she makes is simple and anyone can make her recipes. From Otago Farmers Market Recipes I have chosen one especially for my brother Jamie whom I introduced Cavolo Nero recently. It is also known as Italian Kale or Black Cabbage. Jamie loves silverbeet and grows lots of it, but after tasting Cavolo Nero, the silverbeet may end up in the back row of his garden. Alison’s Caldo Verde uses a combination of greens including cabbage. To get a richer green colour and flavour, add some Cavolo Nero or silverbeet. Remember, the darker the green, the better for you. Gently fry the onions and garlic in the olive oil until softened and translucent. Chop the chorizo or chilli salami into small chunks and add to the pan with the onion. Fry the onions and sausage for a few more minutes and then add the diced potatoes. They will absorb all the flavour from the sausage. Add the stock, seasoning and bay leaves, and cook until the potatoes are soft. When the potatoes are ready, mash them into the broth to make a thick base, add the greens/ cabbage to the simmering broth. Add as much cabbage as the broth will support – if you want heavy soup add loads of greens, if lighter, add less. Simmer for a few minutes. The soup will go the colour of jade. Serve drizzle with extra virgin olive oil. You can buy some great sausages at the market to go into this perfect soup for a midwinter’s weekend. 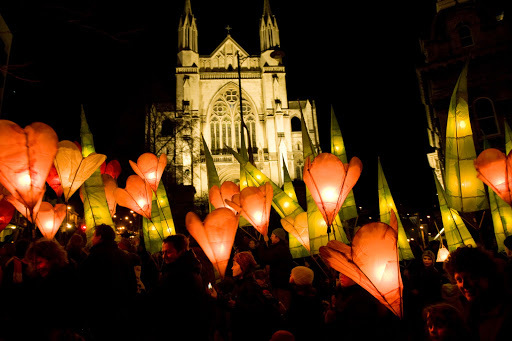 So Dunedin, here’s wishing you a clear fine evening for the Midwinter Carnival – wish I was there. … oh and I haven’t forgotten the Otago Peninsula. I think that needs a posting all to itself. Next posting I will be mixing it with penguins and seals and having tea at a castle.